The Matins and Lauds of the Divine Office sung during the Triduum (Holy Thursday, Good Friday and Holy Saturday) are known as the Tenebrae services (“tenebrae” meaning “shadows”), which is basically a funeral service for Our Lord. As the Traditional Tenebrae services are intimidating for smaller parishes (approximately 2 hours of singing), Monsignor Martin B. Hellriegel, created a modified Tenebrae Service for parishes. He maintains the entire structure of the service, but shortens the readings and psalms. In his Tenebrae services (approximately 45 minutes long), the Psalms are chanted in English according to simple Gregorian melodies and tones, yet some of the Latin and simple Greek Chants are provided (i.e. Christus Factus Est). See sample pages below. Monsignor Martin B. Hellriegel (1890-1981) an Apostolic Protonotary, was one of the giants of the 20th century Liturgical Movement that Pope Pius X inspired. A native of Heppenheim, Germany, his most productive years were spent in America, where he was chaplain to the Most Precious Blood Sisters in O’Fallon, Missouri, then pastor of Holy Cross parish in St. Louis. Monsignor Hellrigel was influential in promoting liturgical reforms that Pope Pius XII had urged in Mediator Dei, his 1947 encyclical on the liturgy—in particular the restoration of the Easter Vigil and the participation of the congregation in the chants of the Mass. 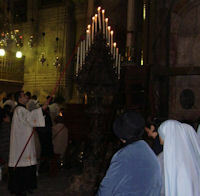 During the Triduum, the Matins and Lauds readings come from the following day’s readings each night because the hours of Matins and Lauds were pushed back so that the public might better participate during these special three days (i.e., the Matins and Lauds readings heard at Spy Wednesday’s tenebrae service are those for Maundy Thursday, the readings for Maundy Thursday’s tenebrae “Cercis siliquastrum” service are from Good Friday, and Good Friday’s readings are from Holy Saturday’s Divine Office). Legend says that the tree upon which Judas hanged himself was the “Cercis siliquastrum”—a tree that is now known as the “Judas Tree.” It is a beautiful tree, native to the Mediterranean region, with brilliant deep pink flowers in the spring—flowers that are said to have blushed in shame after Judas’s suicide.